Czech forward Petr Cajka buried the back-end of a 2-on-0 with Kyle Maksimovich to knot the score at three on Saturday night. 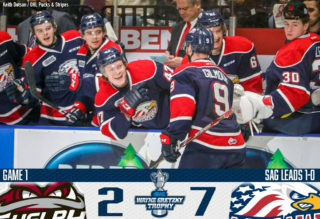 The Erie Otters would eventually fall to the Saginaw Spirit by a score of 4-3, but Cajka’s first OHL goal was a bright spot in the loss. The 12th overall pick of the 2018 CHL Import Draft has three points (1-2–3) through his first five games of the season. 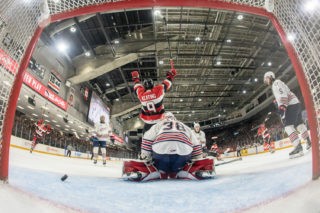 Bryce Caruk camped out in the slot and banged in a rebound on an initial shot from linemate Griffin Wilson, helping the Owen Sound Attack defeat the Oshawa Generals 4-2. Caruk’s first goal past Oshawa’s Kyle Keyser came 7:18 into the first period. The 17-year-old from Courtice, Ont. was Owen Sound’s 11th round pick in the 2017 OHL Priority Selection. 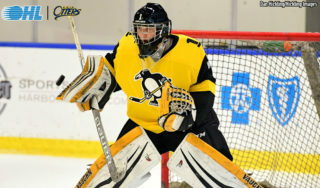 He spent last season with the Whitby Wildcats Midget AAA team. Nando Eggenberger went to the net and finished on a rebound to score his first career OHL marker. The product of Chur, Switzerland finished on an initial shot by linemate Kyle MacLean as the Generals fell by a score of 4-2 in Owen Sound. The goal came on the eve of Eggenberger’s 19th birthday. He was the 33rd overall pick of the 2018 CHL Import Draft. 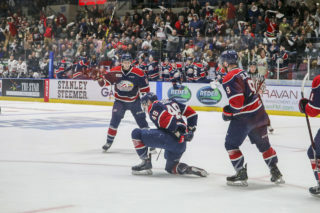 Hamilton Bulldogs rookie Avery Hayes teamed up with veteran forward Brandon Saigeon, one-timing a feed off the rush past Peterborough’s Hunter Jones. The goal came 11:34 into the second period as the Bulldogs defeated the Petes 3-2. 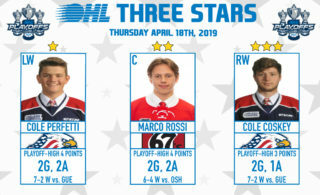 A 15-year-old native of Westland, Mich., Hayes scored in his third OHL contest after being a sixth round pick by the Bulldogs last spring. 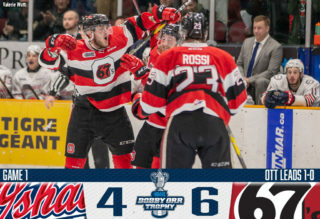 Marco Rossi buried his own rebound for his first of two goals on the afternoon as the Ottawa 67’s defeated visiting Barrie 4-3. Rossi’s first came with 1:05 left in the opening period before he struck again 5:15 into the second. He also won 11 of the 14 faceoffs he took on the afternoon. Rossi was the 18th overall pick of the 2018 CHL Import Draft and hails from Feldkirch, Austria.